SBES Protector ‘buddy system’ is the long awaited answer to the Health and Safety dilemma surrounding those working alone in dangerous situations. The system is designed for individuals who service multiple sites and need the flexibility of a portable lone worker system. 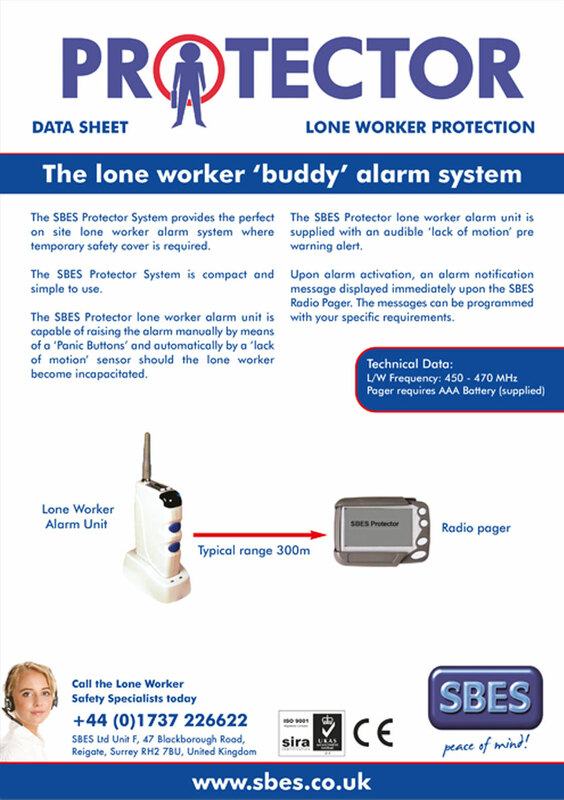 The system is simple and comprises of 1x SBES Lone worker alarm unit and 1x SBES Radio Pager. The lone worker simply attaches the lone worker alarm unit to their belt or overalls and gives the SBES Radio pager to an on site staff member – if the lone worker gets into trouble the alarms will be sent to the radio pager indicating that the lone worker requires assistance. Mechanical and Electrical Engineers, Air Conditioning, IT and Telecommunications, Lift Engineering, Refrigeration, Facilities Management and all individuals who work alone. Protector – the portable 'buddy system' for Lone Workers. On arrival at site engineer leaves pager with reception or agreed personnel. Emergency procedures can be set in motion.